A home never quite feels clean if the floors are not clean. Since floors are always being walked on it can be hard to keep them clean without seemingly always cleaning them. There is a way you can use minimal effort, less time, and safe green cleaning solutions to keep your floors in top shape. 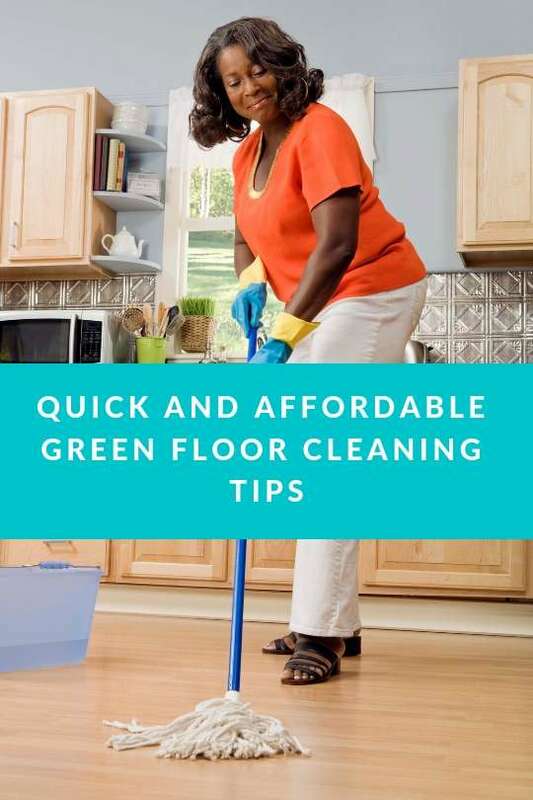 Read on for quick, affordable, green floor cleaning tips for all types of floors. Wood floors are loved for their durability, but even the highest quality wood floors need protection from the abrasive scratching of dirt. The best care for hardwoods is a daily sweep or dry mop. For a quick natural shine up steep two tea bags in water and then gently wipe floors down with a soft cloth. Tannic acids in tea create a nice sheen. An eco-friendly flooring choice that is growing in popularity. The biggest thing to remember with cork is not to use a lot of water, cork is porous and too much water absorbed into the tiles can cause swelling. Just a mild soap and water solution used in a quick mopping once a week will suffice on a sealed cork floor. A soft bristle broom is a vinyl floor’s best friend. To mop, use a solution made of a cup of apple cider vinegar and a gallon of water. This cleaner can be stored in a large container and will keep well for future cleanings. For tough stains use a bit of rubbing alcohol followed with the apple cider vinegar solution. Gentle cleaning and regular vacuuming are best for laminate floors. Avoid the use of steam mops on laminate floors because the use of too much steam can cause laminate to buckle. The best care for natural stone floors is to ensure they have a fresh coat of sealant and are regularly dry mopped. When a wet cleaning is needed use a pH neutral soap made specifically for stone diluted in water. Make sure to dry the stone after wet mopping. Porcelain and Ceramic tiles are strong and durable and easy to keep clean with a simple soapy water solution. Just make sure to keep the mopping solution less soapy to avoid leaving a film. Make sure to use a non-abrasive mop or sponge. Hydrogen peroxide works great on tough spots and stains. Tip for Grout- a clean tile floor is only as clean as its grout. Grout is porous and easily harbors grime. To keep grout lines clean use a paste made of baking soda and water, let it sit for a few minutes and gently scrub with an old toothbrush. To help easily keep floors clean it is a great idea to have them professionally deep cleaned at least once a year. For professional hard surface floor cleaning and sealing in Everett and surrounding areas make an appointment online or over the phone with All Kleen. We serve Snohomish and North King Counties.